How Is Biotechnology Involved in Biofuel Production? University of Buffalo (UB) researchers report they have discovered the “central mechanism responsible for the action of the powerful biological catalysts known as enzymes,” providing critical insight into why catalysis is so complex, according to a National Institutes of Health publication by UB professor of chemistry John P. Richard and UB adjunct associate professor of chemistry Tina L. Amyes. 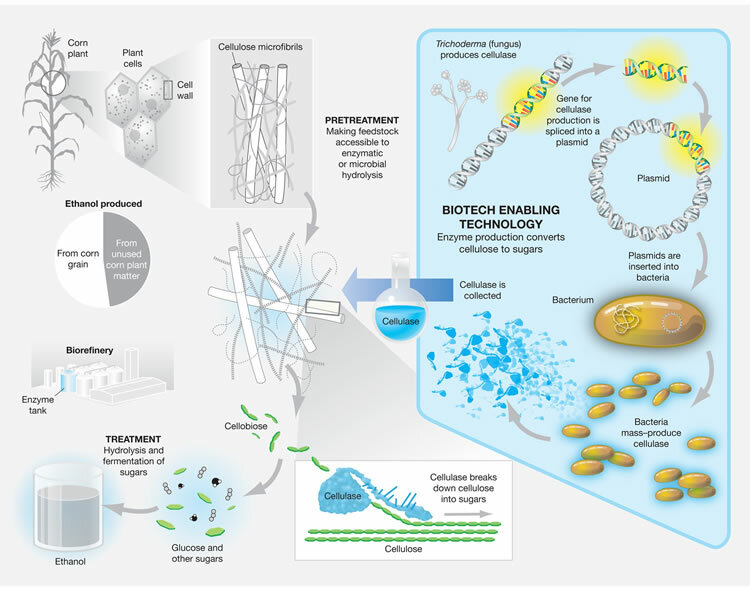 “Attempts to replicate evolution and design catalysts of non-biological reactions with enzyme-like activity have failed because scientists have yet to unravel the secrets of enzyme catalysis. These findings demonstrate a simple principle of catalysis that is important for many enzymes that catalyze reactions of substrates containing phosphate groups and which can be generalized to all enzymes,” said Richard. Comparing the “enormous” molecular weights of protein catalysts (10,000 to more than 1 million) with those of synthetic catalysts (typically 1,000 or less), “the recent results by Richard and Amyes provide critical insight into why effective catalysis requires such large molecules,” the publication reports. The first step of catalysis is recognition of the substrate, by the catalyst, which, in the case of man-made catalysts, is limited to “several atoms,” said Richard. “Amyes and Richard have provided compelling evidence that interactions between enzymes and non-reacting portions of the substrate are critical for large catalytic rate accelerations,” the article reports. Chemistry between a catalyst and a substrate occurs where amino acid groups of the catalyst interact with the substrate, said Richard, but enzymes also have domains that interact with the non-reacting parts of the substrate. “A flexible loop on the enzyme wraps around the substrate, burying it in an environment that’s favorable for catalysis. In order to bury the substrate, certain interactions are necessary that allow the loop to wrap around the substrate and that’s what the phosphate groups on the substrate are doing. We’ve shown that these interactions are critical to the process of making reactions faster. We have found that the interactions between phosphate groups and several enzymes are used to promote the chemistry even in the absence of a covalent linkage. These results have surprised many enzymologists,” said Richard.